K. Dot is coming to the home of Congress. Each spring, the Congressional Institute sponsors a nationwide high school visual art competition with the winning entrant having their work displayed or one year at the U.S. Capitol. This year the judges were clearly feeling DAMN. because Pueblo, Colorado's Tiona Cordova was awarded the top prize with her painting of Kendrick Lamar. Cordova, a student at Pueblo's Centennial High School, received the news from Colorado Congressman Scott Tipton. In addition to having her work hang in Capitol Building, Cordova will also be honored at a Washington D.C. ceremony later this year. Check out her artistic work above. 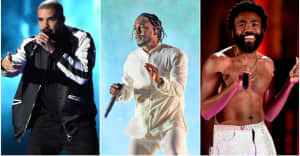 Kendrick Lamar, meanwhile, will be in Washington in July as part of his extensive DAMN. tour dates.